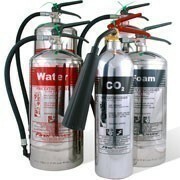 Chrome fire extinguishers, available in water, CO2, foam and ABC powder versions. 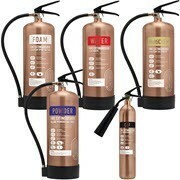 Antique copper fire extinguishers, available for CO2, foam, water, powder and MultiCHEM. 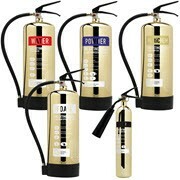 Polished gold fire extinguishers, available for water, CO2, foam, powder and MultiCHEM. Did you know that Designer Extinguishers actually make it possible to comply with fire safety regulations without having to compromise on the aesthetics of your business premises? In fact, they’re even nice to have around the home. Now fire safety can go hand-in-hand with style. In fact, your compulsory fire safety equipment can actually compliment the most fashionable interiors. So whether you’re kitting out a trendy office space, a luxury hotel, modern bar, or even a stately home, you have a range of choice which will suit their surroundings. The Designer Extinguishers are all made from stainless steel which is then finished by hand to create their unique appearance. The benefit of being constructed with stainless steel is that it doesn’t corrode, meaning they can last longer and are even suited for marine environments and swimming pools. The only exception to this are the CO2 extinguishers which are made from a lightweight aluminium. Highly polished to create their mirror finish, they’re a popular choice for shops and offices. This is because they allow them to keep staff, customers, and visitors safe but don’t stand out like a sore thumb as a red extinguisher might. The ultimate in luxury, they have a polished gold mirror finish which is beautifully crafted by hand. They’re a great choice for a high-end shop, luxury hotel, stately home and even the odd castle. Each one is unique having been hand finished to create its beauty. The antique brushed copper finish means they’ll fit right in at your modern bar and restaurant, as well as contemporary shops and barns. These Designer Extinguishers are made using all of the same components as their red counterparts, so match up to their high standard. You can rely on them in an emergency and they’ll ensure you comply with the Fire Safety Order 2005. However, they do not carry a Kitemark or BAFE approval simply because BS EN3 requires the body of an extinguisher to be 95% red. This isn’t a problem and your fire extinguisher service engineer will be able to maintain them as normal. All you have to do is ensure you have the right extinguishers to counter the threats in your business. And you should have no problem as our range includes all of the standard extinguisher types, available in different sizes.